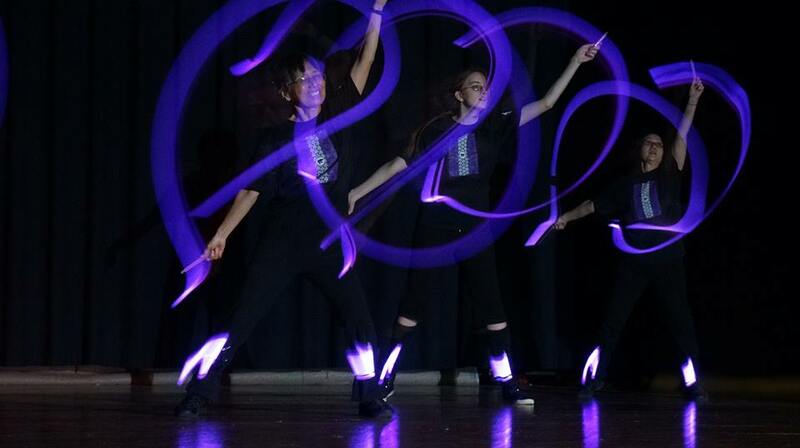 Yosakoi added a little flare to their usual routine by performing without lights, using purple glow sticks! 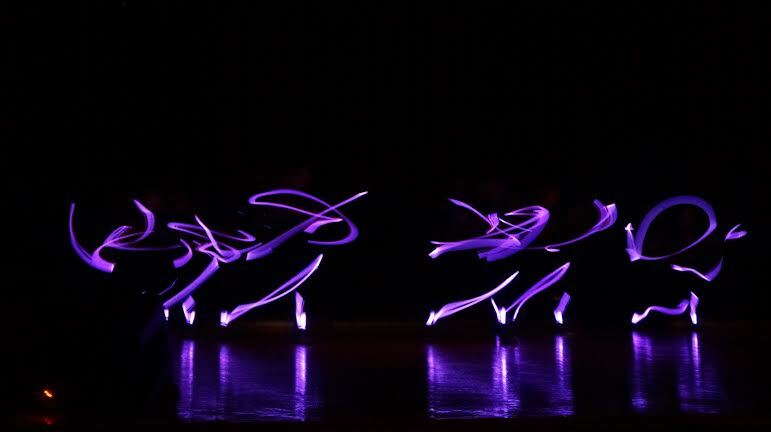 In some ways, using glow sticks was challenging, in the timing was important to make a grand impression. Mistakes were obvious! Still, we enjoyed the change and performed once more with red glow sticks at the Greater Kansas City Japan Festival in October, 2014. Following the GKCJF, Yosakoi participated in the Homecoming Week festivities. Here we won 1st place in Sidewalk chalking. 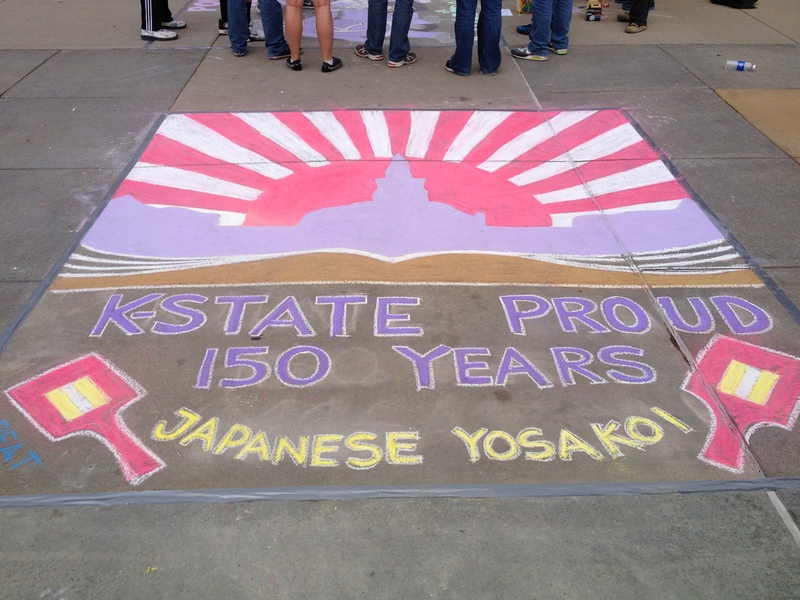 The theme celebrated the 150th anniversary of Kansas State. 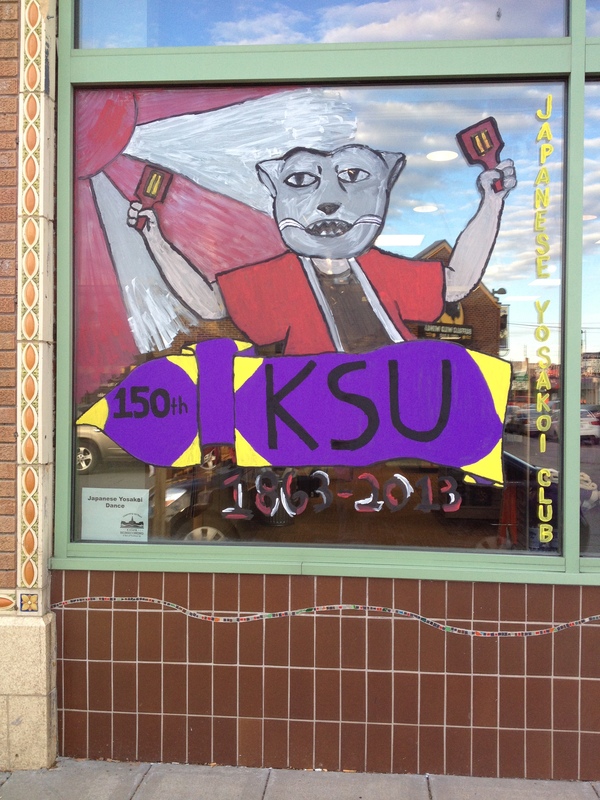 We also placed with our entry in Paint the Ville on the window of Varney’s in Aggieville. Our usual stint at the GKCJF was lots of fun. 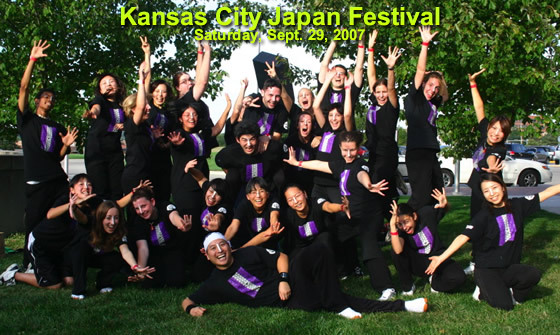 GKCJF is one of the largest Japanese festivals in the midwest. We performed Yocchore, Samurai and Soran Illusion. After the performance in Yardley Hall. Relaxed and relieved! We were well received and all is well! In the back –David Smith (pumped up), Micah Weltsch; Middle row–Kayla Dieker, Christine Kim, Julie Leon, Ryan Cloyd. Front row–Abby Sarvis, Maia Williams, Barbara Johnson, Yichao (Katherine) Zhang. Great job everyone! 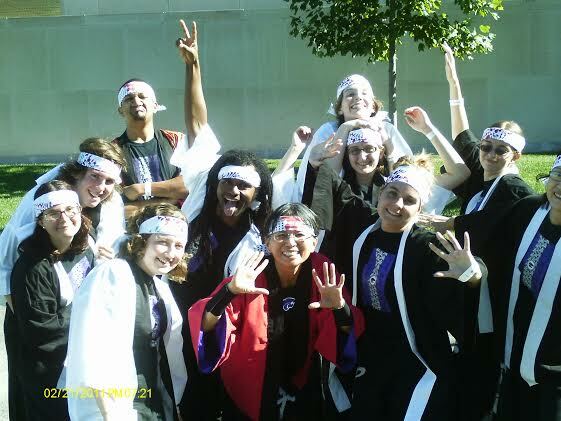 KSU Yosakoi performed again at the Greater Kansas City Japan Festival on Sept 24, at the Johnson County Community College. Here we are performing Soran Bushi, one of the more traditional Yosakoi Dances. We also performed Samurai and Gakko You Kyozai. We all had a great time and were able to enjoy other activities at the festival, including new to this year’s festival, Sumo. Imagine a 600+ lb Japanese sumo wrestler, apparently the heaviest ever in Japan!